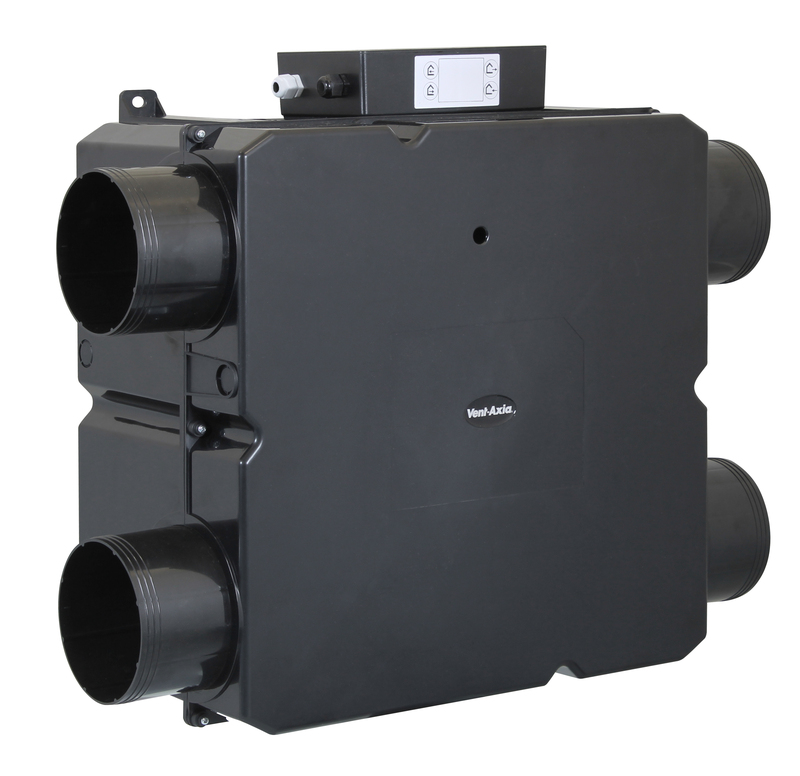 The Integra Plus heat recovery unit has been specially designed to provide ventilation for flats or internal rooms in large residential, commercial, educational or leisure applications. Balanced ventilation is achieved by using nominal 150mm ducting. The unit includes two integral centrifugal speed controllable EC fans plus a high efficiency polymeric heat exchanger. The Vent-Axia Integra Plus EC boasts a temperature efficiency of up to 70%. The compact cube interleaves outgoing moist air with incoming fresh air, allowing the heat from one to warm the other without the two air streams mixing. Energy is saved on room heating, with no power being used by the cube itself. installation in ceilings voids, cupboards or lofts. The Integra Plus has three speed options: Normal, Boost and Purge. Heat exchanger: should be of a multi plate cross-flow type constructed out of a polymeric material with ultra sonic welded joints. Motor: should be a 240V 50Hz EC with sleeve bearings, greased for life. It shall operate up to an ambient temperature of 40°C and be fitted with a manual reset thermal overload protective device. Fan: The fan impeller should be a forward curved centrifugal type, dynamically balanced. Controls: The commissioning panel provides independent adjustment of the motor speeds on normal and boost settings via the panel mounted potentiometers. The Integra Plus shall also include a remote switch with LED filter check and fault condition warning indicator, Boost, Purge and Summer Setting button. Ducting spigots: The unit should have 4-N° 150mm Ø x 50mm spigots. (Can be converted to flat ducting). Condensation: the outlet provided should be 22mm Ø located on the end, lid and base. Construction: the unit outer case should be a rigid black ABS moulding. The case should split along a horizontal joint to allow maintained access.